Accommodation at Quinta do Vale do Monte. 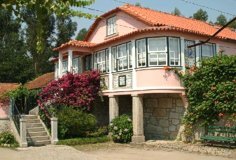 Quinta Vale do Monte is near in Viana do Castelo about 5 kilometres away from the Atlantic beaches. The estate comprises a total of 10 acres of vineyards, fruit and pine trees. The main house dates back to the 19th century and was restored for tourism. The original style of the main building and surrounding cottages was not changed as it is definitely one of the features of this property. In addition to the main house, there is the former white wine cellar (Adega Branca) and the cereals grain store (Casa Eira), both also converted for tourism providing a total of 3 bedrooms. The main house comprises a total of 4 bedrooms of which two have twin beds and a covered balcony each. All the bedrooms in the main house have traditional portuguese furniture, ensuite bathroom or shower room and mini bar. Casa Eira - Double bedroom with ensuite shower room, air condition and television. Adega Branca Cottage - Living room with a sofa bed and an open fireplace. Kitchenette (light meals only) equipped with a small oven, fridge/freezer, 2 ring electric cooker and dining table for 6 people. Double bedroom with ensuite shower room. Twin bedroom with ensuite bathroom. Private garden with a portable barbecue and table for outdoor dining. All bedrooms have central heating for winter use. Guests have the use of the communal living rooms in the main house, including a games room with a snooker table. Outside there is a swimming pool in the lawned garden. Swimming pool towels are provided. Nearest restaurant is at approxcimately 200 meters from the property. Viana do Castelo is about 5 kilometres away. The house is located about 40 minutes drive from Oporto airport.